Home » What is the “Symphonia of powers”? What is the “Symphonia of powers”? The origins of the Orthodox doctrine of the Symphonia of the Church and State, or rather Church and Kingdom (Empire), can be found even in the Epistles of the holy Apostles. But, in fact, it is not only about the state, but also about the Emperor. The Second Epistle of St. Paul to the Thessalonians (2-6-7) states that “Man of sin” (a world ruler, who claims to be Christ, the Antichrist) will not come until he “is taken out of the way”, “is keeping back” ὁ κατέχων; St. John Chrysostom equated this figure to the Emperor. As long as the Empire does not have an opportunity to unite the world, to set the capital in Old Jerusalem and to create a global “network” led by the Antichrist, “false Christ”, a descendant of the tribe of Dan, seducing both people and “pagans.” The Ancient Church believed that the Roman Emperor (any, even a tyrant and tormentor!) can defend from the worst absolute evil on earth, and therefore prayed to the Emperor even in the era of persecution. The discrepancies between the Christians were only about whether the Christian monarchy is needed or not, given that Jesus Christ was the King of the Kings and the Lord of the Lords. Part of the early Christians, mostly the Jews, gave a negative answer to this question, but as the Church united the Indo-European nations with their national traditions, aspirations of the Christianization of the Empire intensified. After the holy equal to the Apostles, Emperor Constantine the Great, made Christianity the religion of the Empire, the issue of the possibility or impossibility of the Christian Empire was solved definitively. The Empire entered the Church, and the Church entered the Empire. The Holy Fathers conceived this as something similar to the sacrament of coronation. Hence the rank of Kings Coronation and the less recent theological opinion that the royal coronation as the church another sacrament (sharing by Pavel Florensky, but not widely adopted, but not condemned). “All authority has been given to me in heaven and on earth” (Matt. 28:18) says our Lord Jesus Christ Himself. However, the Christian West and East split over understandings of the nature of this power by the middle of the first millennium. The Roman Church believes that its head is the Pope, “Vicar of Christ on earth”, inheriting from Jews the contempt for “treyf kingdoms.” Here we have an idea of St. Augustine that kings are robbers and the descendants of robbers can nevertheless gain a certain extent of “protondulgence” through the power of the Pope and Bishops (“the Pope makes kings”). For the Orthodox East, the Head of the Church is Christ, his image; his icon is the king, and all superiors of local churches, including the Pope, have equal dignity. The Monarchs (first of all the Universal Emperor) obtain power from the authorities, from God, but in secret, in their mother’s womb), and the coronation and the anointing are confirmation of this election. Hence why the idea of Christian democracy was quite extraneous for the East, especially for Russia. Recently, in the early 90’s, there were several attempts by very well intentioned people to create Christian Democratic parties on the basis of Orthodoxy and “Russian religious philosophy”, but they all fatally failed. We should note that, first of all, the West was more ready to accept as Leutenant Cristi the Monarch (Clovis 466 - 511, and his descendants), but then the papal curia brought to power usurping clans. In general, historical and legal science knows three main types of relationships between religious and governmental authorities: papocearism (the “head of the church” is also the head of state, it was the plan of Patriarch Nikon and the majority of the episcopate, including Metropolitan Anthony (Khrapovitsky) in February-March 1917), caesaropapiss (the British monarchy) and Byzantine-Moscow “Symphonia” that we are talking about. According to the principle of the Symphonia, the Emperor, as the representative of the Church, can convene the Ecumenical Councils in the case of an emergency, and especially in the case of heresy (the heresy is always a violation of the Creed). He asks the bishops and has a right to a deliberative vote. The bishops have the right for decisive vote, but the question is solved only unanimously (liberum veto). When there is no unanimity, a decision cannot be made. If it is made, the Emperor can sign off on (or not) the decision, but the decision is still deemed to be acceptable only if the people of the Church accept it (i.e. reception). During the interregnum, the Patriarch keeps the imperial regalia, while the interpatriarchate, the patriarch regalia, are kept by the King. After the death of Patriarch, the Local Council should choose three candidates, thus the King chooses the Patriarch. When there is no King, a lot is cast. In 1393, the Patriarch of Constantinople Anthony, explaining in his message to the Moscow Grand Prince Vasily Dmitrievich the value of a Universal Orthodox empire, wrote: “Holy King holds a high place in the Church, not like the other local princes and sovereigns. Kings strengthened at the beginning and confirmed piety in the whole universe. The kings gathered Ecumenical Councils. They also reaffirmed their adherence to the laws that say the divine and sacred canons of right-wing dogma and on the improvement of the Christian life and labored against heresy. Finally, the kings with their councils’ regulations determine the order of Episcopal Church and set the boundaries of the Metropolitan District and episcopal dioceses. They have a great honor and occupy a high place in the Church for all these. <...> At every place, wherever there are Christians, the King's name is remembered by all patriarchs, archbishops and bishops, and this advantage is not for any other princes or sovereigns. <...> It is not possible for Christians to have a Church and not to have a king. The most important point is that the king is the only one, and the Patriarch is not. The Patriarch title appeared in the 5th century, and was a church leader of the province as a part of the Empire. In three rank of hierarchy, he didn’t have his own place. There is the “sacred sugubitsa” of Patriarchs of Constantinople (Ecumenical), of Alexandria (also with the Pope title), of Antioch, of Jerusalem and of Rome (Pope, Patriarch of the West). They all were within the Empire, and the Emperor was a mediator between them. After the dissolution of Rome in 1054, the place of the Pope remains free, and only in 1589 was there the Patriarch of Moscow and All Russia. The Byzantine Empire didn’t exist here anymore. The Moscow Patriarch, although formally replacing the Pope, wasn’t considered as the first, as one of Roman and of Constantinople (Ecumenical) was, but the fifth. Fighting for the creation of a Moscow Patriarchate began in the next century under Alexei Mikhailovich and Patriarch Nikon, which I will explain to you later. The Ferraro-Florentine union (1438-1445), in which the Imperial power, in fact, replaced the Orthodoxy (although the synod named the Imperial, was legitimate), but it was saved only by St. Mark of Ephesus’ vote and ended Second Rome. The “Russian time” begins. Moscow comes into Roman dignity as the only world's independent of external union Orthodox kingdom. At the same time, which is extremely important, it is not a linearly mechanic temporary continuation, but an “upgrade” of “Second Rome.” The famous scientist of the Russian Middle Age N. Sinistina (http://byzantion.ru/ romania_rosia / st1.htm) says: “the relationship between the royal and the patriarchal power in the Moscow State determined largely by the fact that the coronation did not require the Patriarch presence, while the Patriarch ordination required a necessary condition for the king presence. The fact that the king presence in Russia determines the patriarch ordination, and not vice versa, correlates Moscow kingdom with the initial period of the Byzantine Empire, when, in accordance with the decision of the Council of Chalcedon in 451, in Constantinople, the patriarch appeared along with the emperor (king). This corresponds to the understanding of Moscow as New Constantinople and the Moscow governor as the New Constantine. Accordingly, the Moscow kingdom can be understood as the Third Rome and New Constantinople, not as much the continuation, but as a renewal of Byzantine history.” The new fact is that, in contrast to the Byzantine Empire, the Moscow kingdom (and later in the Russian Empire) was ruled by the royal family (as it was in Europe before Vatican regicide in 5th – 8th centuries). 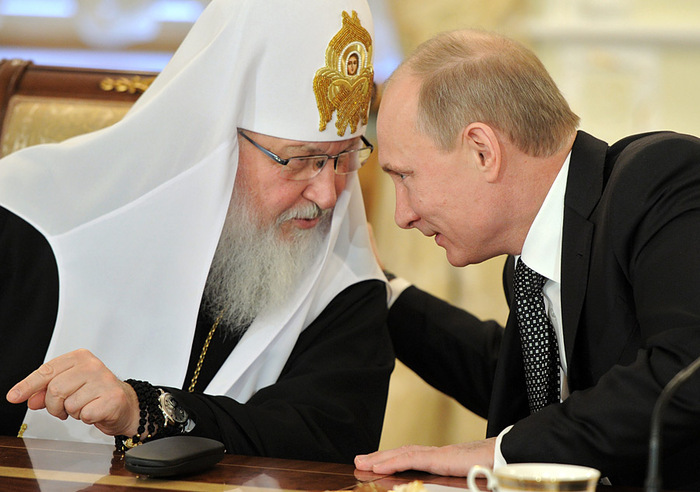 Thus, we have a purely Russian Orthodox kingdom formula: “God, in image of His heavenly unity create the King on the Earth, in the image of his governance autocratic King, in the image of His everlasting kingdom, extending from and to the King inheritance” (St. Filaret of Moscow). Moscow kingdom from the beginning stressed the role of the King, which was proclaimed under Justinian, when any Patriarch had not yet been “Universal”, and all of them were primate of the Church of different provinces, thus the pervasive nature of the Patriarchal title rank was only an honorary bishop and did not have anything in common with the “head of the Church.” It was fully explained by King John IV Vasilyevich the Terrible in the Great Seal of Russia, which he founded in 1577: “It has double-headed eagles, whose iconography is the same with a seal of 1562, with one exception: there the eagles with a single crown with an Orthodox cross, instead of two small crowns over the heads of birds on the earlier Royal seals. The unity of royal crown with eight-pointed orthodox cross made him a symbol of capacious and specific, this crown could only mean power of the Orthodox King autocracy, which have combined secular and ecclesiastical powers.” (Origins of Russian heraldry. P. 132-133 (http://shabdua.livejournal.com/4289346.html)). The Stoglavy Synod in 1551 retained it with five famous Church bishops, including St. Macarius of Moscow and Gourias of Kazan, which was convened by Tsar Ivan the Terrible, signing his decisions. In fact, Stoglavy Synod is the last Synod in the history, convened in strict accordance with the Kormchaia. It approved the ancient title of the Church as the foundation of the kingdom and the future of the Empire. But since the middle 17th century, something “wrong” starts to happen. Why did it all begin? It is another issue. The so-called Great Moscow Synod 1666-1667 was robbing (its decisions are considered as mistake by the Local Council of the Russian Orthodox Church in 1971) not because the King called it without the Patriarch, but because the Eastern patriarch, who was present, was at that time without location, and imposed vows and bans on the ancient Russian liturgical rite, used by Russian saints from St. Vladimir to St. Patriarch Hermogenes. But all the same “inner buckles” were preserved. Somehow in the 18th – 19th centuries, they remained important for Imperial, Third Rome kingdom-church unity: the correct sacrament fulfillment, Eucharist, hereditary, dynastic of Imperial power and peasant community. Despite all the changes, the unity of the Kingdom and the Church remained the official ideology during the St. Petersburg period. The Collection of Laws of the Russian Empire protected the church and was special. The Orthodox Church proclaimed to be “leading and dominant”; the Russian Emperor could not profess any other religion than the Orthodoxy. He was regarded as “the supreme protector” of the Orthodox Church and the “guardian of Orthodoxy.” In 1905, “at the will of the Emperor” Martyr Nicholas II, the reconciliation with the Old Believers started, without it the “Symphonia” could not exist. The most disgusting thing was a different event. The overwhelming majority of Russian Church leaders welcomed the February Revolution and blessed the Provisional Government, hoping that the overthrow of the monarchy would lead to some recovery of a theocratic (actually hierocratic) system “on biblical models”: the two centuries of seminary training with Protestant books made it, but in fact, not only it. Last but not least was the role played by a hierarchy hobby (including those of the best of them, like St Andrew of Ufa (Prince of Ufa) with “ontology of the Book of Judges” and the Old Testament in general). The clericalism in general is not the Orthodox teaching. They rejected our Lord Jesus Christ, who said: “My kingdom is not of this world”, and it is not accepted by the Ecumenical Councils, the church's traditions, and canonical right. You can talk about the clericalism in Roman Catholic teaching, but not in orthodoxy. However, each class has its own sins. However, the history of his word said the stiffness of the Soviet regime was a hundred times harder than all the imperial “restraints” of all ages, and the official ideology of the Orthodox country, paradoxically, was declared to be “militant atheism,” however with distinct features of religious faith, despite the fact that most of its ideologues had little in common with the Russian people. In fact, primordial Russian belief manifested in the “kingdom of truth” and in rejection of “bourgeois” indifference. Meanwhile, entirely paradoxical, unexpected, in spite of the revolutionary chaos and Communist ideology, the Soviet Union, since 1930’s, became more and more traditional for Russian society, and the Russian people, despite formal atheism, retains the features and the moral foundations of the Orthodox people roughly until the end of the 1950’s and early 1960’s. It was promoted by the short period of “spring of the Church” in 1943-1956, connected with the victory over the European aggression and the restoration of the Patriarchate. But since the “Khrushchev thaw”, the westernization of life has led to the collapse of the Soviet Union in 1991, and the Westernization of consciousness touched even the Church, and the faithful, especially among the intellectuals, for whom the religious faith is increasingly identified with the political opposition and the liberal aspirations. After 1991, the Church “gained freedom,” but this freedom was only a deepening of the Bolsheviks proclaimed “separation from the state”, more precisely the implementation the “Leninist thesis” (in a short period of 1943-1956, there was some sort of “Symphonia”, and then after the so-called “Khrushchev persecutions”, the Church, although persecution stopped, came under the hard press of the party and political leadership, on the one hand, and the liberal “ebionists”, on the other hand. The liberal reception of 1990’s once again showed that the rejection of (any) traditional paradigms does not lead to “progress”, as it was imposed by one people and was naively assumed by others, but only to regress, rot, and lose vitality. But here again, everything is a new thing. During the reign of the current Head of State of the Russian president Vladimir Putin, who is together with Patriarch of Moscow and All-Russia Cyril's on the first joint mission of the Russian state leader and the head of Church on the Mount Athos, which is obviously paving the incomplete way to a true Symphonia: many things are already “fixed”; many things remain to be “fixed”. In fact, the current political system in Russia is not communist, but even not quite liberal. Yes, technically, it is still “republican-democratic” and “secular” heritage, as well as “the whole world” French and American revolutions. But in fact, it is the closest thing yet to the “Byzantine Rome” and not to Moscow (though the latter features, of course, are visible), but the Roman Principate of 1st - 3rd centuries. We should remember what does the term Principate mean for the political system of the early Roman Empire. Its foundations were laid by the first Roman emperor Augustus (27 BC-14 AD), whose goal was the restoration of a strong central government without a formal break with the republican institutions. Augustus and his successors were concentrated in the hands the supreme military, civil and priestly power, which formally “endowed” the Emperor, the Senate and the National Assembly. In fact, the transfer of power was through the successor appointment. The political system was officially called the “republic”, and the supreme ruler – “princeps”, which means the “first.” This arrangement provided so-called “August’s world” for two centuries. Then, starting with Diocletian (284-305), the system of “Byzantine Rome” (not Christian yet) starts. This is actually the way to the Monarchy. Today, time is reduced, and the two “Roman centuries” can happen in two decades, and most likely even faster. But the crossing is unacceptable. The disruption is worst of all. The question of the restoration of a fully-fledged Russian state will appear somehow (a thousand-year tradition cannot be interrupted by someone will, as was tried in 1917 and 1991). But it may be true, that “the time of the Principate” will be delayed. We do not know the times and seasons, not only the final, but even preliminary, it should only be based on. The main thing is the next one. The Orthodox “Symphonia of monarchy”, despite the all fall, continues to be the ideal of the Orthodox state and society, the only complete type of the state, which can show you the way, not even existing. At the same time, if the beginning of the Third Rome was “upgrading” the beginning of the Second one, today, at the being of its end (and even at the “end of everything”), we return to the upgrading of the Third one, to the beginning of the reign of Blessed King John, generally to the Johns of Moscow, starting with Ivan the Red (1326 - 1359), but now in the space of the Great Continent, not only as the Russian Empire, but also Eurasian Empire of the End. But this is not the Fourth Rome - there will not be a fourth, and it is the Third Rome, but in its full dimension. Everything else is defeat and failure. “We aim to bring everything back!” It is the one of the political slogan of the Eurasian Youth Union. But it doesn’t mean “back” and only “back”. It is “forward” and “up”. On May 28th at 13:00 on Tsargrad channel, the “Russian Athos” telethon begins.